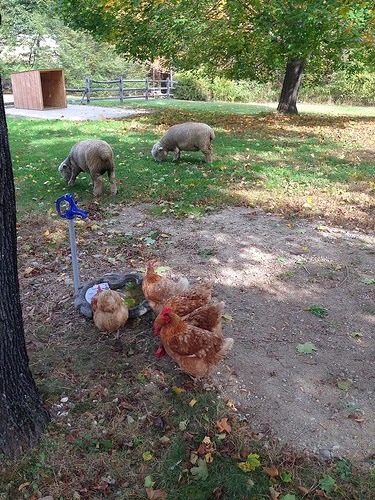 We let out our sheep nearly every day to free range. They stay in our yard and keep out of trouble, for the most part. We only let them out when we're home, so we can keep an eye on them, but we haven't had any problems thus far. When they can see any people nearby, they graze and walk around like innocent creatures. Then, when they don't see any people nearby they start their "unsupervised children" antics. Ordinarily they will headbutt each other and run around kicking their feet and being goofballs. We have also spotted them feasting on the mums that sit on our back porch, then running away when they see us and pretending it never happened. But recently we noticed they're starting to get bold. They had never gone into the front yard, because we don't let them because of the danger of cars, but when they realized that there was an abundance of flowers and yummy plants up there they had a worthy cause. They've only gone there a couple times but we immediately chased them back to the backyard so they wouldn't get any idea's. It seems to have worked well, because we haven't seen them do it since. One of the good things about sheep is that they seem to learn things from repetition, and that has proved extremely helpful when it comes to free ranging. 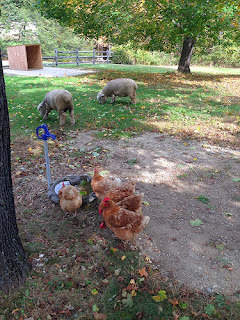 We have yet to have any problems since unlike free ranging chickens, they have one type of predator, which they can run from for a little while, giving us time to notice and come scare it off.